Pest control is something that every business owner and homeowner alike have had to deal with. Unfortunately, most people don’t call to a professional pest control company until the problem is far worse than they’ve realized. While your local pest control company will always be able to find a solution to your infestation or pest problem, it’s always good to have a thorough understanding of how these situations arise. 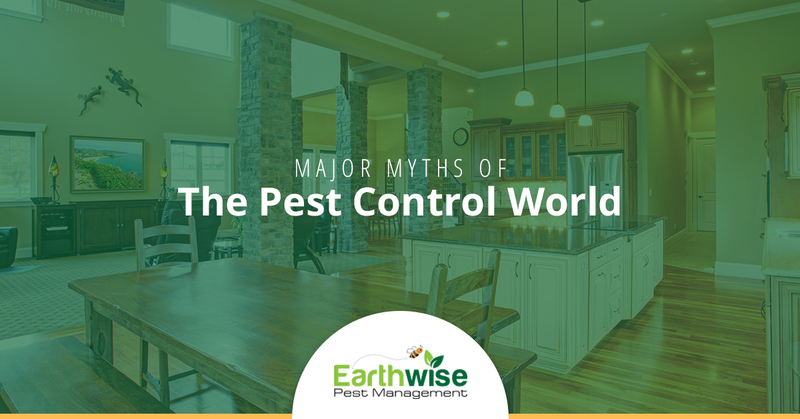 Over the years, there are various myths that have come to surface regarding the pest control industry. From the way that pests become a problem to the ways that professionals take care of them, we felt it was important to clear the air and bust some of the most commonly heard pest control myths — let’s dive in! When talking about preventative ways to minimize your chances of pests, cleaning is always one of the first things that come up. If you’re keeping your space clean, then you shouldn’t have pests — right? Though having a clean house can minimize the chances of you dealing with pests in your space, it won’t eliminate the chance. Messy houses are more likely to provide pests with the two things that they need: food and a space where they can be left undisturbed. Not only do messy places leave pests with an easy to access food source, but the chances of a pest being able to quickly find a space where they can make a new home are heightened. As a whole, pests really just have an easier time of making their presence hidden while they’re in a messier location. One of the pests that supports this point is bed bugs. These little pests are extremely difficult to get rid of, but they’re very easy to transfer. Sure, you’re more likely to find bed bugs when you’re in a dirtier place, but that doesn’t mean that they can’t make their way to a clean space too. Stay on top of pests in the building that you’re in by keeping an eye out for any signs of pest problems. A myth that we’ve heard for years goes hand in hand with the saying out of sight, out mind. The end result is a lot of people thinking that because they haven’t seen any pests around, there isn’t a pest problem. Though this could be the case every once in a while, there are many pests that require very little to survive and can remain out of sight for days at a time. Cockroaches are a great example of pests that often go out of sight and out of mind. These pests are ones that we all would hate to find in our homes, but the reality is that they’re more often out of sight than not there at all. Being able to survive without food for an entire month and needing only small doses of water a week, cockroaches can thrive on very little. They also make homes in dark, undisturbed places, making them extremely difficult to find. While you may think that you’re free of pests because you haven’t seen them, that isn’t always the case. By taking care of leaks, patching up easy entrances, securely storing your food and checking for potential places that pests would thrive, you can minimize the chances of pests in your home. Doing so will also make it so that you can take care of any problem before it becomes more serious. As a professional pest control company, you can imagine how frustrating it is to hear that the solutions that we offer are dangerous to the public. Pesticides have always been known for posing a danger to people, and when we’re exposed to the dangers of pesticides in our food, it can be all the more nerve-wracking to turn to professional pest control solutions when you need them. For years pest control solutions meant high doses of chemicals in the house, which left you and your family equally exposed to the same chemicals that pests were dying from. Though some pest control companies still utilize these forms of pest control, Earthwise Pest Management does not. Our team practices a form of pest control known as Integrated Pest Management (IPM). This form of pest control offers a safe and efficient method of pest control to residences and commercial buildings alike. We look at the root of the problem so that we can determine what’s drawing pests to your space in the first place. Then we responsibly remove these pests and provide you with the information that we’ve found so that you can better plan for the future. At the end of the day, we strive for safe, long-term solutions. For that reason, don’t believe that the pest control services that you’re receiving from our team of professionals will ever put you, your family, your customers, or your employees, at risk. If you have any pests taking up Sacramento residence in your residence or in your commercial space, contact the team at Earthwise Pest Management. Our pest control professionals have years of experience tackling all types of pest control problems. Whether it’s a consultation that you’re in need of or you’re ready to schedule your services, contact us today, and we’ll get you taken care of! For any questions, concerns or inquiries, go ahead and call us and a member of our team would be more than happy to help!